InventHelp®, America's leading inventor service company, announces that one of its clients, an inventor from Billerica, Mass., has designed a device that assists in carrying a large water bottle. This invention is patented and a prototype is available. The "Lug-A-Jug" would enable an individual to pick up a water cooler bottle without the strain typically association with such an effort. The unit could provide additional leverage and reduce the amount of back strain placed on an individual hauling the bottle. Designed to enable a user to move a large water bottle more quickly and easily, the unit could eliminate the hassle of having to grip a water cooler bottle awkwardly. 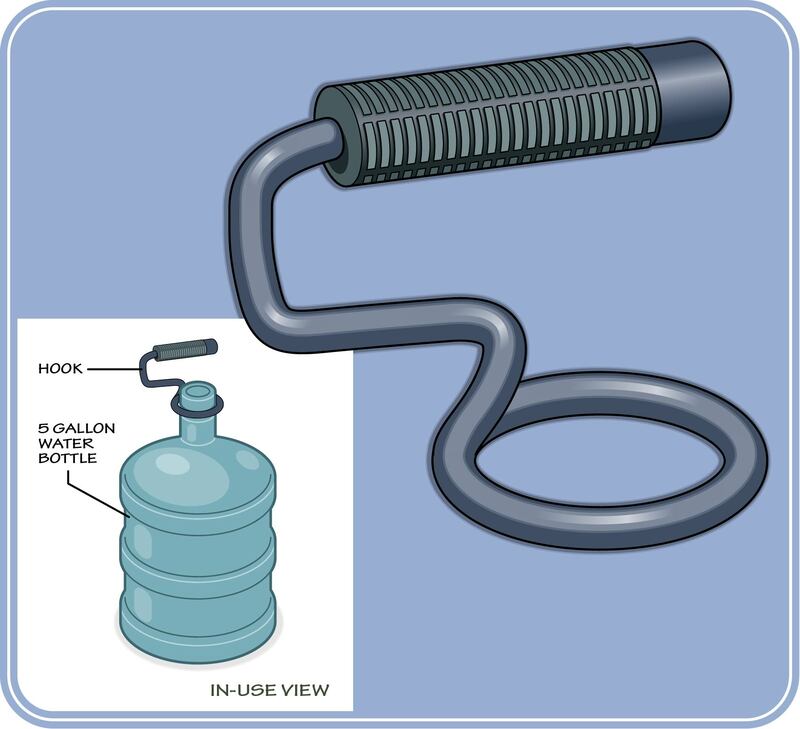 The Lug-A-Jug would consist of a curved metal bar with a ring at the end and an attached handle. The unit would measure 4-1/2-inches long and 5-inches wide. The interior of the ring would have a diameter of 3-inches. The handle would feature a rubberized grip. The bar would ascend from the handle on the left side and curve in an M-shape before connecting to the ring. The ring would sit adjacent to the handle. The user would grip the handle and slide the ring over the mouth of a 5-gallon (48-pound) water bottle. The ring would fasten securely around the neck of the water bottle, which would allow it to be transported without slipping or dropping. The middle area of the bar would provide leverage that would facilitate the user in lifting the bottle. The user would pull upward on the handle and transport the bottle to its destination. Variations in material and colors may be produced. InventHelp® is attempting to submit the invention to companies for review. If substantial interest is expressed, the company will attempt to negotiate for a sale or royalties for the inventor. For more information, telephone Dept. 05-BMA-2905 at (800) 851-6030. Learn more about InventHelp® and their Invention Submission services at http://www.inventhelp.com.